I'm the one on the rightIt's official... I'm at the point where I don't really want to be a year older any more! My birthday was last week and I celebrated it this past weekend at Grim's with my good friend Erin (don't bother following her she doesn't tweet). I took my flip camera with plans to put together a video of the party, but of course as soon as I got to the party I completely forgot about that plan until it was too late. Oh well, it's probably for the best... it most likely would have ended up being just a bunch of people yelling into the camera anyways. Got a great view of Seattle on my flight home from Las Vegas last week. We flew over Elliot Bay, then looped around right over downtown. And it was that perfect time of night when the sun is setting so it's still light enough to see the lakes and hills, but it's dark enough that the city is lit up. The Seattle Storm called me in to the office earlier this week, to shoot a video message from Ashley Robinson. When I get there, it turns out they also want to shoot an in-studio type interview, so I've got about 1/2 hour to build a set, using stuff I could find around the office... and I think it turned out pretty well if I do say so myself. I used a room divider as the backdrop, with two desk lamps behind it to give it some depth. 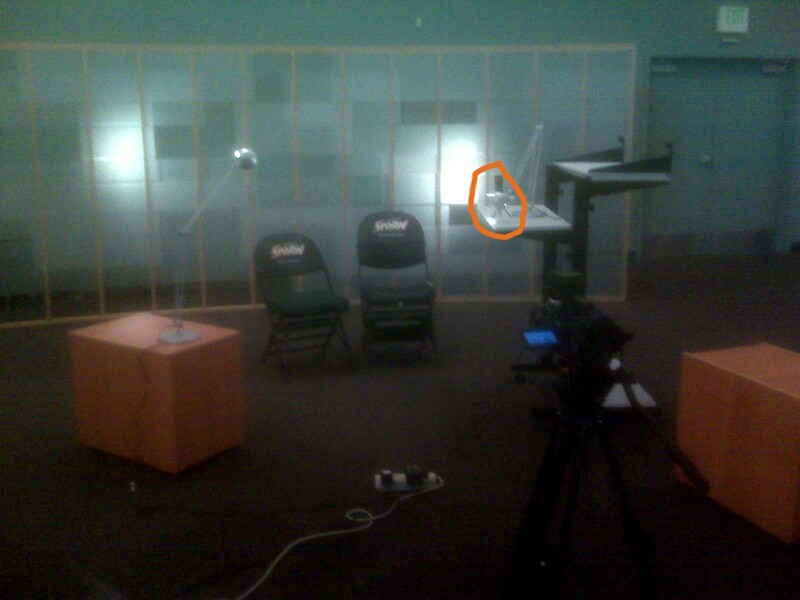 I had my flip mino hd (with tripod) in my backpack so I used that as a second camera (circled in the pic below)... I've found that the flip works OK as a second camera for these kind of interviews, as long as you can figure out how to get it in close enough to get a tight shot with it. I guess it might actually make more sense to use the flip for the wide shot, since it doesn't zoom, but I don't have enough faith in the flip for that just yet. I'd rather know for certain that the wide shot is going to look good, since the tight shot isn't really necessary. I had two more desk lamps to light both the subjects and that was it. The colors from the flip never quite match up perfectly to my Panasonic DVX footage, no matter how much color correction I do, but it looks pretty good, and the benefit of having the second camera angle makes it well worth it for editing purposes. It's worth noting that this interview was produced exclusively for the web, I've never tried, and probably wouldn't try using the flip for something meant for TV. UPDATE - This video is also now up on CHS. Hiked up Bandera Mountain last week with some friends, here's some video I took with my Flip HD. I'm getting more and more annoyed with how difficult it is to get the flip footage to work correctly with Final Cut Pro. I'm exporting the videos before editing them, so they're movs instead of the mp4s that flip records, but I still have problems. Depending on which export settings I use I have different problems with the footage (general errors, playback problems in final cut etc.) but there's always something. The whole point of the flip was to be able to record and upload videos quickly, videos like this one really aren't worth the amount of time I spent on this today! I wonder if the Kodak Zi6 plays better with FCP...? 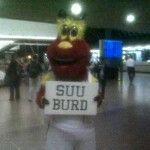 Doppler waiting for Sue Bird at Sea-Tac Couple of my videos up online this week. The first is a Doppler Skit I shot a couple of weeks ago, where Doppler goes and greets Sue Bird at Sea-tac. It's not the greatest thing I've ever shot (some seriously bad audio throughout the whole thing), but it got some pretty good laughs when it played in-arena at the Storms pre-season game. Some of the footage I shot that night also aired on King 5 the next evening. Spike Lee at the Egyptian The other is a CHS article/video of Spike Lee. Spike Lee was being honored with the Golden Space Needle Award at SIFF, so I went and shot some video. The event was pretty dissapointing overall, terrible questions from the moderator and audience lead to a pretty boring couple hours... as you can read about in the comments. Elliot Bay Water Taxi to Alki (Seattle) from David Albright on Vimeo.